Cannex Capital will list its common shares Wednesday on the Canadian Securities Exchange, which has recently become Canada’s – and maybe the world’s – go-to stock market for firms that are exposed to the cannabis sector in the United States. The biggest legal grower of cannabis in the state of Washington is going public in Canada this week, the latest in a wave of American marijuana businesses that are raising money north of the border. Cannex Capital Group Inc. will list its common shares Wednesday on the Canadian Securities Exchange (CSE), which has only recently become Canada's – and maybe the world's – go-to stock market for firms that are exposed to the cannabis sector in the United States. The company is licensed to produce and process marijuana in Washington and sells dried flower, edibles, vape cartridges and capsules to retailers. It's looking to push into other U.S. states and also expand into Canada. Cannabis in the United States operates in a legal grey area. The drug is permitted in some form in certain states, but it is illegal under federal law. This has made it hard for companies to bank and raise funds in the United States. But it has also kept the behemoths of the alcohol and pharma sectors at bay, giving much smaller players willing to take on the legal risks a chance to get in early. "We like the Trump administration. It's fantastic. We don't want to see federal legalization for the next four to six to eight years," said Leo Gontmakher, chief operating officer at Cannex. "That takes away the advantage we have, and lets in big money and big corporations. We're more than happy to see it left alone and regulated on a state level." In 2012, Washington became the first U.S. state to legalize the recreational use of cannabis. And what a boon it's been for state coffers. In 2017, the state generated US$319-million in marijuana-related income, mostly from sales taxes. That's up 70 per cent from the prior year. Income from liquor taxes and licence fees in Washington was US$206-million in 2017, up from US$201-million in 2016. Competition in Washington's legal cannabis market is cutthroat. The state has doled out more than 1,000 licences to grow and process the drug. These legal producers have flooded the state with a glut of supply, which has put pressure on wholesale and retail prices. About 500 retail licences have been handed out across the state. 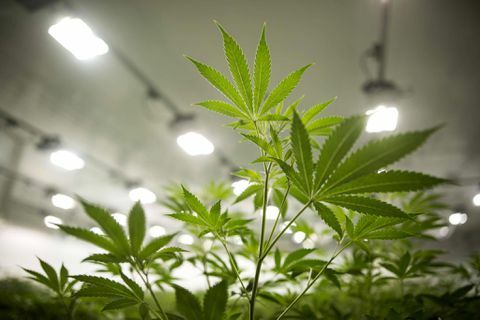 This has made it easy for people to buy legal marijuana and, along with low retail prices, helped take a bite out of the illicit market, Mr. Gontmakher said. In Washington, legal cannabis sells at a wholesale price per gram between US$2 and US$3, says Anthony Dutton, chief executive at Cannex. This time last year, a gram was selling for between US$3 and US$4. Last December, Cannex struck a US$36-million deal to acquire Mr. Gontmakher's firm BrightLeaf Development LLC. Mr. Gontmakher, now 32, was just 26 when he turned his passion for marijuana into a business in 2012, taking the lessons he learned working at his family's seafood company. BrightLeaf holds the assets of licensed producer Northwest Cannabis Solutions, which generated a state-high US$2.6-million in sales in January, according to the 502 Data website. To make it in Washington, Northwest Cannabis has had to be precise and efficient in how it grows, working to squeeze the most out of every square foot at its two 30,000-square-foot cultivation facilities. It says its efforts have helped lower its cost to produce each gram of cannabis to under 70 US cents. If he can make it in Washington State, he can make it anywhere, Mr. Gontmakher says. Cannex is going public through a reverse takeover of shell company Arco Resources Corp. Arco's shares were listed on NEX, which houses the stocks of firms that do not meet the standards of the TSX Venture Exchange. Last week, Cannex closed a $48-million financing led by Beacon Securities Ltd. to pay for the BrightLeaf deal. Investor demand was hot, as the company originally intended to raise $25-million. It is moving its listing to the CSE because TMX Group Ltd. has banned issuers with U.S. cannabis investments from its two stock markets. As of Monday, the CSE had 63 pot stocks on its roster – more than double that of rival TMX Group. The young sector accounts for 17 per cent of the venue's total listings but 63 per cent of its total market capitalization of $11.3-billion and about 57 per cent of total volume of shares traded in the last three months. Cannex is joining 16 other pot stocks on the CSE that do business in the United States. Those include CannaRoyalty Corp. in California; Friday Night Inc. of Nevada; Florida's Liberty Health Sciences Inc.; and iAnthus Capital Holdings Inc., which is operating in six U.S. states. These U.S. companies are in the same boat: violating federal law but racing to grow before the drug becomes fully legal. "My No. 1 fear is that the U.S. market is going to become legal, federally, too soon," Mr. Dutton said.